Softeners, What’s Best-Dryer Sheets or Liquids? Home softenersSofteners, What’s Best-Dryer Sheets or Liquids? You may not think that fabric softener or dryer sheets cause major debates, but everyone has their own opinion on what is best. I’ll present some basic facts for you so that you can decide. Fact 1- Some fabrics should never come in contact with either softeners or dryer sheets. This includes microfibers, spandex, nylon or certain types of athletic sportswear. Check the tags before washing these items. Fact 2 – Liquid softeners can stain clothing. 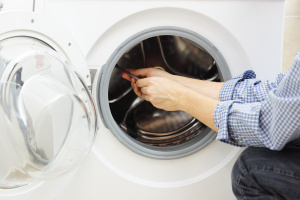 This issue typically happens when the washer is overloaded when the softener is poured during the rinse cycle. Fact 3 – Clothing treated with flame retardant, such as children’s sleepwear or costumes should never be cleaned using softeners or dryer sheets. The chemicals will react to the flame retardant and make the clothing more flammable. Fact 4 – Using ½ of a dryer sheet is as effective as using a whole sheet. Not only will your clothing remain static free, you can stretch you dollar by using only ½ of a sheet. Fact 5 – Both dryer sheets and liquid softeners will help prevent wrinkles and static. Whether you purchase dryer sheets or liquid fabric softeners, the choice is largely what you prefer for your laundry. The bigger issue is when you shouldn’t use either product. Make sure you check your labels to see if the fabric is able to work with a softening agent. Good post for new buyers, if we select a good quality appliance than we save from dryer repairing services.